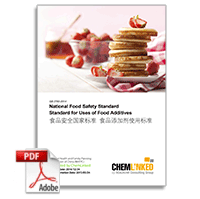 On the last day of 2014, China's NHFPC officially finalized the draft version of China's most significant food additive standard “GB 2760-2014 National Food Safety Standard Standard for Uses of Food Additives”, which will come into force from 24 May 2015 replacing the current 2011 version. Various amendments have been incorporated into the newly updated standard. To help food companies understand the new regulatory requirements that will be introduced under GB 2760-2014, our senior food regulatory analyst Emily Xu will present a comparative analysis of the new regulation and old regulation, overviewing the broad differences in regulatory framework and detailing any new market access requirements under GB 2760-2014. High-quality English translation of GB 2760-2014 has been prepared by Chemlinked and is already available in the E-translation Store. We'd like to offer a special discount to the attendees of this webinar who can get this English copy for $550, $50 less than the original price. Ms. Emily Xu Master in Nutrition & Health, Wageningen University. Emily is one of the senior regulatory experts in the food compliance team of REACH24H. REACH24H's food compliance team is a multidisciplinary team composed of food technologists, toxicologists, nutritionists, chemists, regulatory analysts and language experts with vast insight and practical experience dealing with Chinese regulatory obligations. To have a better chance of your questions being addressed during the webinar, please send them to food@chemlinked.com in advance. The webinar has concluded. Registrants and ChemLinked members have the access to the procedding materials including online video, presentation slides and Q&A collection.